Bine and me started on the 3rd of august 2002 in Vienna/Austria. 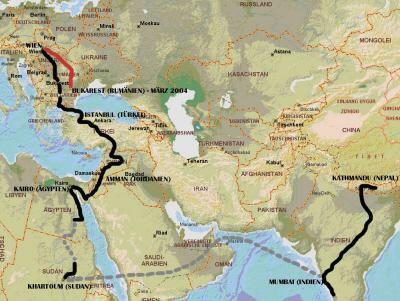 We first crossed south-eastern Europe, reaching Turkey im September 2002. Crossing the Anatolian Plateau we entered Syria and later on Jordan. Our first Country was Egypt, where we celebrated Christmay in Cairo. Sudan finished out short Visit of Africa. A plane took us to India, where we cycled over 3000 Kilometer in the unbearable Heat of Indian Summer. After one Year on the Road we reached Nepal. 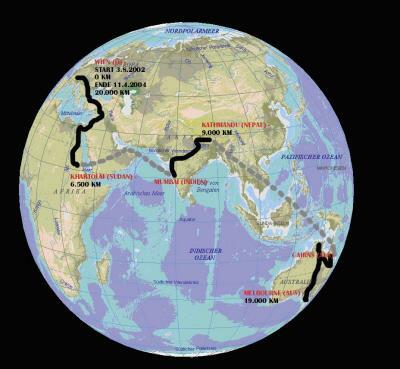 Last Continent was Australia which we entered in Cairns by plane in August 2003. 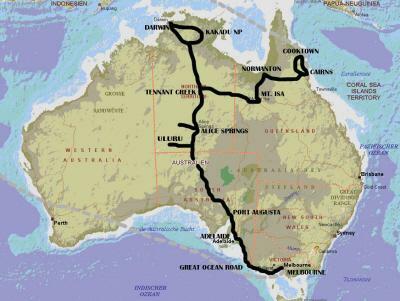 10.000 cycled Kilometers lead us from North East of Queensland to Norther Territory, and then south to Alice Springs, where we celebrated our 2nd Christmas on tour. We reached Adelaide and the Southern Ocean in January 2004, and finished our Australia Trip in Melbourne in state of Victoria. Finally we flew back to Europe, to Bukarest in Romania, and cycled back to the starting point back to Austria. Nearly 20.000 Kilometers in 20 Months.